Welded Metal Bellows – EKK Eagle Semicon Components, Inc.
EKKSC offers a line of edge-welded bellows designed and manufactured by at our EBJ Factory in Niigata, Japan. 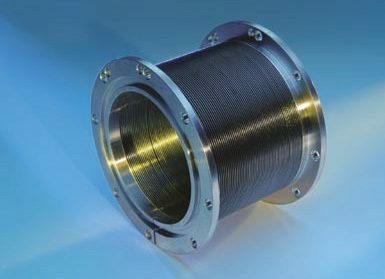 These precision products demonstrate excellent durability, flexibility and corrosion resistance in a wide variety of applications, with superior performance in many corrosive environments including ultra-high vacuum, high pressure, and extreme temperatures. Edge-welded bellows are a nested-type bellows which are produced using a unique ultra-thin metal plate welding technology. The nested-type bellows can secure a wide stroke within a limited space which achieves a compact equipment design. These edge-welded bellows can be made almost completely with weldable materials, guaranteeing ultimate design efficiency in each specification for optimal performance. Special surfacing: EP, anodization, nickel plating, etc. Hastelloy® is a registered trademark of Hayes International, Inc., Corp. Inconel® is a registered trademark of Huntington Alloys Corp.